Provide comfort for the family of Oscar Ellsworth with a meaningful gesture of sympathy. Oscar was born May. 27, 1929 in Edgerton, KS to Calvery and Lela Rose (Beath) Ellsworth. He graduated from Edgerton High School in 1947. Oscar served two years in the U. S. Army, during that time he served in the Korean War. He married Evelyn Allen in 1950, and they had two sons: Daniel was born in 1953 and David in 1955. Oscar attended an electronic school for two years. He worked for the Bendix Corp, Kansas City, MO. for 27 years as an electronic technician retiring in 1984. Oscar and Evelyn ran their own subcontracting business Ellsworth’s Electronic for 20 years retiring again in 2012. Oscar was an umpire and a manager for the Olathe Youth Baseball Summer Leagues, spending many hours with his boys. He enjoyed being active in his boys lives. Oscar loved dancing with his wife, and they danced for many years, with many friends on Saturday nights. Oscar was a jitterbug specialist. He was a member of the Olathe United Methodist Church and he will be dearly missed by family and friends. He was preceded in death by his parents; brothers: Harry, Heber, LeRoy, Robert; sisters, Luella, Lela Rose. Oscar is survived by his wife of 68 years; sons, Dan and wife, Diane and Dave of Olathe, KS; brother Ronald Ellsworth of California; 3 grandchildren: Julie, Danny, Kelly; and 7 great grandchildren. We encourage you to share your most beloved memories of Oscar here, so that the family and other loved ones can always see it. You can upload cherished photographs, or share your favorite stories, and can even comment on those shared by others. 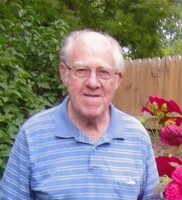 Provide comfort for the family of Oscar Lavern Ellsworth by sending flowers. Please accept my deepest condolences for your loss of your beloved. May you draw comfort from our Heavenly Father, who comforts us during our trials and sorrows with the resurrection promised by Christ Jesus mentioned at John 5:28,29. My deepest condolences to the family for your loss. Our Heavenly Father gives us a comforting thought when He tells us that soon death will be "swallowed up forever." (1 Cor. 15:54) Along with this, God also promises that ones who have died will be able to live again. (John 5:28,29) I hope these encouraging scriptures can bring you some comfort during this difficult time.